Sunflower 'Autumn Beauty' is a beautiful mix of tall sunflowers in warm shades of yellow, gold, bronze-orange and burgundy-red. The flowers vary in size up to 6" across. The plants are branching. 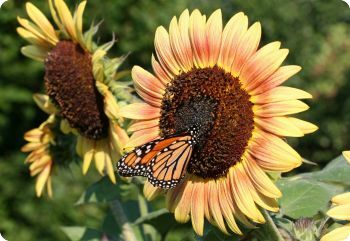 Sunflower is a host plant for many butterfly species, including Painted Lady, Bordered Patch, Gorgone Checkerspot, and Silvery Checkerspot. Sunflower (Helianthus annuus) is a North American native wildflower that has been domesticated to create many different garden varieties. Sow sunflower seeds outdoors after the last frost date, 1" deep. Thin to 18" apart. Full sun. Easy to grow. Sunflower 'Arikara' is a very tall variety with large yellow flowers that have black centers. The flowers appear singly or in clusters. The single flowers can grow up to 12-16" in diameter. Certified organic seed. Arikara sunflower is an heirloom variety. It was grown as a source of edible seeds by the Arikara tribe of native Americans in North Dakota. This tall sunflower adds height to the garden, and the ripening seeds attract birds. Sunflower 'Chocolate Cherry' has 5-8" wide, deep burgundy flowers with dark chocolate centers. The plants are nicely branched. Chocolate Cherry sunflower is lovely at the back of the border. It also makes a great cut flower. Plant bushy annuals like rudbeckia, four o'clock, cosmos and zinnia around the base of sunflowers to hide the leggy stems. Sunflower 'Lemon Queen' produces many soft lemon-yellow flowers with dark chocolate centers. The flowers are 4-5" in diameter. Lemon Queen sunflower is known for being especially good for attracting bees and beneficial insects. Sunflower 'Velvet Queen' has 4-6" wide, mahogany-red flowers with near-black centers. The plants are well-branched. Velvet Queen sunflower is especially nice when paired with yellow sunflowers for a bold contrast.